As a kid I was never a fan of beef jerky. To be fair, my exposure was mainly to Slim Jims, which I believe most would agree is hardly representative of jerky as a whole. When I entered the work force, a friend of mine exposed me to Jack Links beef jerky, which was much more flavorful. Then again, in comparison to Slim Jims, that’s not all that hard. I liked the KC Masterpiece flavors as well as the Chicken Fajita and A-1. It all seemed so nice… that is, until a friend of mine blew it all away with Krave Jerky. I’ve had three kinds to date: Garlic Chili Pepper, Smoky Grilled Teriyaki and Pineapple Orange, of which I love them all. There is also Chili Lime and Sweet Chipotle. My favorite, though, hands-down has to be the Pineapple Orange. 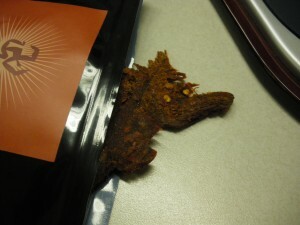 Krave Jerky’s Pineapple Orange blows away any and all preconcieved notions you might have about beef jerky. It’s moist and juicy, brimming with flavor. The sauce sticks a little to your fingers for that finger-licking-good moment afterwards. The combination of pineapple and orange flavors gives the treat an exotic taste… citrus and sweet, but not too strong. Flavors that nip at your taste buds and refresh when you’re done. Garlic Chili Pepper is exactly as advertised. A hint of garlic with some crushed pepper hits you hard and fast. But again, the spicy ingredients accompany some of the most moist jerky in town. A WONDERFUL treat. The Smoky Grilled Teriyaki is most reminiscent of the “beef on a stick” that you can get at a Chinese restaurant. 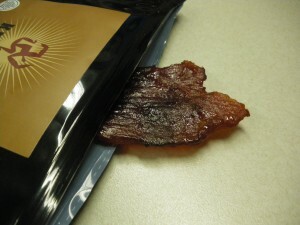 The flavor is nice and again, the jerky is soft and moist. Going back to Jack Links after a taste of Krave is almost impossible. In comparison, the Jack Links that I have found are hard, tough, and almost tooth breaking when trying to tear off a piece. Most reminiscent of a dog’s chew toy. And that is a REAL shame to me because I DO like the taste, but much like the Fresh From the Factory Reese’s Peanut Butter Cups soured me on the experience of those you get at the store, Krave Jerky makes almost anything else impossible. 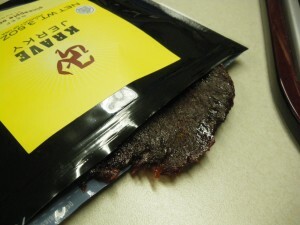 Love jerky! Awesome — i am getting some now! Thanks for sharing.